The development of land-based small modular reactors has been ongoing and some models are approaching commercialisation or licencing stages. Small nuclear reactors (SMRs) have been in use for marine propulsion for several decades and could provide a bridge to the introduction of land-based SMRs. Compared with other technologies, large nuclear power stations have a relatively high up-front cost and take a long time to construct. These factors act against the construction of large nuclear plant as part of the energy mix, at least in South Africa. Furthermore, an operational lifetime of 60 years or more makes this an unattractive investment for all but governments. The trend today is for short-term (≈20 year) investments in power plant, and current thinking dictates that baseload generation is unnecessary. Climate change mitigation apart, fossil fuels will run out in the future and there is a need to look to other sources. The move away from fossil power, including coal, gas and oil, leaves two choices: renewable energy sources or nuclear. We will probably not see large nuclear plant being constructed in this country in the near future, but the situation could change in the longer term. Even if this happens the tendency to use smaller, short build-term plant may dominate. The downsizing of the nuclear component in the IRP also favours smaller distributed plant. The answer of course is small modular nuclear plant. Much has been written on this subject and a lot is being invested in R&D but very few demonstration plant are available. There are numerous SMRs under development but only a handful are approaching commercial or pilot/prototype status. There are even some under order. In the background, small-scale nuclear plant have been in use for the last 50 years in a non-power generating function, namely marine propulsion, and well-developed reactor plant available from several manufacturers could be adapted for power generation applications. SMRs have been used for decades in the marine propulsion environment and have reached a high state of development as well as safety. Over 140 ships are powered by more than 180 small nuclear reactors and more than 12 000 reactor years of marine operation have been accumulated. Most are submarines and range from icebreakers to aircraft carriers. Although marine nuclear may not hold much interest for South Africa at present, it is worthwhile looking at this class of small plant as a possible future power source. The possibility of using floating power plant based on gas engines or turbines has been established and similar conditions would apply to floating nuclear power plant (FNPP). The majority of marine nuclear plant has been used for naval or military purposes, mainly in submarines and aircraft carriers, although a few cruiser-type nuclear powered naval vessels have been in use. The main civilian use has been in icebreakers, an area where conventionally-fueled vessels cannot operate effectively. Several commercial nuclear powered vessels have been developed and taken into service, but proved to be expensive to operate and have been converted to conventional fuel operation. The reason for the high costs are not known. If adopted on a large scale with standardised designs, one could expect the cost to decrease significantly. However, the move away from fossil fues opens the door to commercial nuclear powered vessels again, as marine transport cannot be run on solar or wind power (prior to steam and diesel power, all vessels used wind power, but this could not function in today’s competitive market). Fig. 1: Akademik Lomonosov impression . Small reactors have powered aircraft carriers, submarines and icebreakers for decades, so the technology is not all that difficult to implement. There is considerable interest in small nuclear to power larger commercial vessels such a container ships and LNG transporters. Marine transport and shipping is one area where renewable energy does not hold much promise, although kite-driven and wind-driven ships have been proposed, in a return to the sailing vessels of the past. Marine NPPs in operation today are all of the pressurised water reactor (PWR) type, using highly enriched uranium, originally 95% U235, but now reduced to 40 – 20% U235 in some vessels . 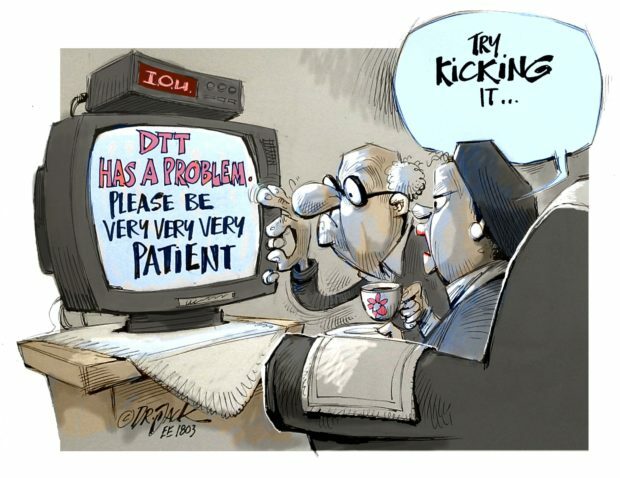 Other technologies have been used but were taken out of service because of operational and technical problems. Capacity of plant ranges from around 20 MW for submarines to 700 MW for large craft, consisting of several reactors. In large craft, the NPP is used to power the entire vessel and not only for propulsion. Rolls Royce has provided nuclear power plant for British navy submarines since 1950, ranging from the PWR1 (≈78 MWt) to the current PWR3 model under development. The design is based largely on American technology. Nuclear naval propulsion systems have been developed since the 1950 by the Bettis Naval Nuclear Laboratory, originally run by Westinghouse but transferred to Bechtel Marine Propulsion Corporation in 1990. Bechtel provides most of the nuclear reactor components. Reactor size ranges from ≈40 – 300 MWt . All naval nuclear propelled craft are built by DCN with reactors supplied by Areva. Reactor sizes range from 48 – 150 MWt. Fig. 2: Proposed FNPP from CGN . Reactors for marine propulsion are provided by the China National Nuclear Corporation (CNNC). Submarines are built by the China Shipbuilding Industry Corporation (CSIC). Two reactor sizes are in use: 58 and 150 MWt. The success of the naval or military marine nuclear plant has led to two new concepts for small nuclear power plant, namely the floating nuclear power plant (FNPP) and the submerged nuclear power plant (SNPP), both based on the existing NPP used for marine propulsion. Putting nuclear reactors on a ship to supply power to remote islands, offshore facilities and coastal areas isn’t a new idea. A marine reactor was used to supply power (1,5 MWe) to a US Antarctic base between 1962 and 1972, testing the feasibility of such air-portable units for remote locations. The US Army built the world’s first floating reactor, the SS Sturgis MH-1A, a 10 MW converted Liberty Ship, in 1967. It supplied power to the Panama Canal zone from 1968 to 1975 before being defueled in 1977. Recent developments have produced several advanced purpose-designed floating nuclear power plants. In 2010, Russia launched the 21 000-tonne, 70 MW Akademik Lomonosov, which is expected to be deployed in 2018 or 2019 to Vilyuchinsk, on the remote Kamchatka Peninsula . Akademik Lomonosov is an autonomous power facility, manufactured as non-self-propelled vessel. It is 140 m long, 30 m wide and 10 m high. It has a draught of 5,56 m. Its displacement is 21 500 t and is crewed by 70 people. The vessel will be equipped with a power unit using two KLT-40C nuclear reactors, providing 300 MW of heat for two steam-driven turbine units providing 70 MW of power. It can also be converted into a desalination plant with a capacity to produce 240 000 m3 of fresh water each day. The first reactor was delivered in May 2009 and the second in August of that year. Each reactor is enclosed in a steel hermetic containment vessel to withstand the pressure. The project will have offshore and onshore facilities to transfer the energy and power generated from the plant. The energy and heat generated by the offshore units will be transmitted onshore. The onshore facilities will further transfer the heat and power to the grid. The project will save 200 000 t of coal and 100 000 t of fuel oil each year. The offshore vessel will accommodate the reactors, steam turbine plants and storage facilities that house fresh and nuclear fuel assemblies, as well as solid and liquid radioactive waste. The plant will undergo servicing and maintenance at the Baltic Shipyard once every 12 years. It will be refueled every three years. China General Nuclear (CGN) has two small ACPR designs: an ACPR100 and ACPR50S, both with passive cooling for decay heat and 60-year design life. Both have standard 17 x 17-type fuel assemblies and fuel enriched to <5% with burnable poison giving a 30-month refueling. The ACPR100 is an integral PWR, rated at 450 MWt and 140 MWe, with 69 fuel assemblies. The reactor pressure vessel is 17 m high with a 4,4 m inside diameter. It operates at 310°C. It is designed as a module in larger plant and would be installed underground. The applications for these are similar to those for the ACP100. The offshore ACPR50S reactor is 200 MWt, 60 MWe with 37 fuel assemblies and four external steam generators. The reactor pressure vessel is 7,4 m high, with a 2,5 m inside diameter, and operates at 310°C. It is designed for mounting on a barge as floating nuclear power plant 24/65 (FNPP). 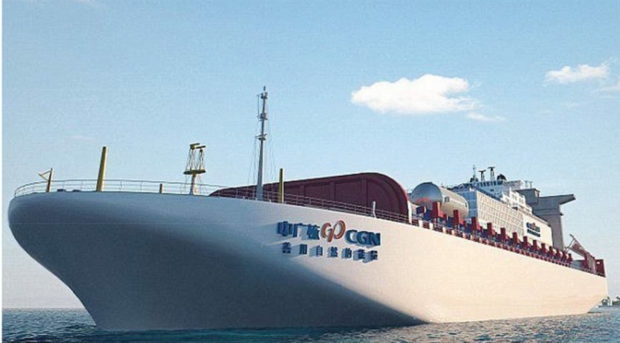 Following approval as part of the 13th five-year plan for innovative energy technologies, CGN announced the construction of the first FNPP at Bohai Shipyard in November 2016 for trial operation in 2019, supplying power generation and desalination functions. Fig. 3: Proposed submerged nuclear power plant (DCNS ). There are about 150 nuclear submarines roaming around the world today, so putting a nuclear plant underwater is not exactly a novelty. Evacuation of power from offshore power plant has been well established thanks to offshore windfarms, and poses no problems. The output of an SNPP is of the same order as current offshore wind farms, and technology is well developed. Moorings and anchors use similar technology to wind turbines, so nothing new is needed here. The leader in this area is the Flexblue concept being developed by the French company DCNS, in collaboration with Areva. 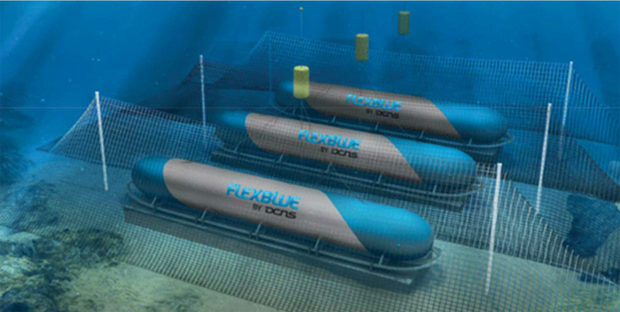 The design of the Flexblue reactor will be derived from nuclear powered submarine reactors, although it will be carefully demilitarised owing to some major changes. The reactor fuel will be a standard 17 x 17 civil fuel assembly because military fuel performance will not be necessary for civil use. The secondary side of the turbine and operating part of the reactor will also be adapted for commercial use, and the safety systems will be redesigned to use more passive safety systems as the reactor will be immersed and stationary on the sea bed (Fig. 2). The Flexblue reactor is a pressurised water reactor which will retain the pressure vessel and the steam generators of operating submarines. The reactor will produce around 60 MWe. This is the first time that DCNS attempts to enter the civil nuclear market. Military budgets across Europe are generally declining and like other companies in this field, DCNS is looking to civilian markets to maintain industrial capacity, jobs and competences. According to DCNS, an underwater civil nuclear reactor has never been attempted before. A similar system has been proposed by Russia’s OKBM, but uses a small, high-temperature gas-cooled reactor of advanced design . The FNPP lends itself ideally to the NPP/DSP concept. With the increasing shortages of water worldwide, application of nuclear power to desalination is likely to increase. The Russian version can be used for either power generation or desalination, or for a combination. Conventional nuclear power plant, including marine plant, are owned and operated either by government-owned utilities, the military, or by large, private utilities, allowing for a high degree of control over operation of the plant and for the training of staff. Development of SMRs opens the door to ownership and operation by smaller, privately-owned utilities and organisations including large industrial power users and mines. Operating a NPP of 50 MW capacity is not the same as operating a coal, diesel or gas power plant of the same rating, and may require the same degree of training as a large NPP. Development in the field will require close attention to the training of operators, which might well affect the operating costs of the plant unless simplified and automated operation is possible. Whether safety regulations will allow a market to develop for private ownership remains to be seen, and the possibility that all small plant will have to remain in the hands of large utilities and government is quite strong. J Lin and PW Singer: “These are China’s plans for floating nuclear reactors”, Popular Science, August 2017. Global Construction Review: “China launches nuclear company to build 20 floating reactors”, August 2017. A Kolmeyer: “Blue submarine: The flexblue offshore nuclear reactor”, Power Engineering International, Vol. 19, Issue 5.